Wondering what these arguing Autobots are saying? 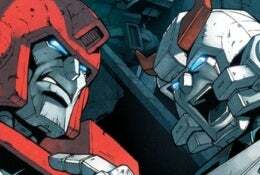 So is Transformers: All Hail Megatron writer Shane McCarthy, who's so curious that he's started up a contest to find out. Winner takes all - or, at least, the first third of the dystopian "Megatron has won and the human race is screwed" series. Details and full image under the jump.